dj KENTARO is a Hip hop DJ from Japan. 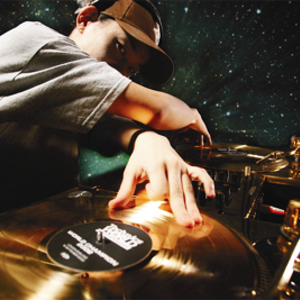 He came 3rd in the Technics DMC World DJ Final in 2001 and won it in 2002 at the age of 20. In doing so, he became the first ever Asian to win the DMC World DJ Final, receiving the highest score in DMC history in the process. He was signed to Ninja Tune independent record label and released a Solid Steel DJ mix album in September 2005, entitled On The Wheels of Solid Steel. The tracks on the album come exclusively from Ninja Tune's back catalogue. He was signed to Ninja Tune independent record label and released a Solid Steel DJ mix album in September 2005, entitled On The Wheels of Solid Steel. The tracks on the album come exclusively from Ninja Tune's back catalogue. Kentaro recently supported hip-hop artists The Roots and The Pharcyde, and frequently collaborates with HIFANA.